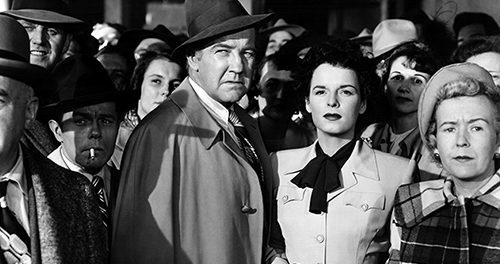 Broderick Crawford plays a small-town hick who attracts a populist following that takes him all the way to the governor’s mansion, even though his ascent is riddled with corruption and crime. All the King’s Men is really about Crawford’s support team and how they weather his immorality. John Ireland and Mercedes McCambridge play the two key supporters. They begin the film bright-eyed and full of optimism for their candidate, but as his true colors begin to show, they find themselves dragged down into the mud with him. Can you compare this story to 2019’s current presidential administration? You betcha. And the film also makes a nice companion piece to 1957’s A Face in the Crowd, which is frankly a more engaging picture all around. All the King’s Men feels overly procedural in comparison, perhaps trying too hard to hit all the expected notes from Robert Penn Warren’s Pulitzer Prize-winning novel. Director Robert Rosen (The Hustler) nonetheless manages to cram enough grace notes into the film for the cast to leave memorable impressions. Crawford’s commanding presence earned him a best actor Oscar, while McCambridge won the supporting actress trophy. Indeed, there are moments when McCambridge’s laid-back naturalism makes the rest of the cast feel out of her league — especially in comparison to Joanne Dru, who overacts atrociously as Ireland’s fiancee. John Derek is also memorable as Crawford’s teenaged son.